With Christmas only a few days away, I'll be taking a break from blogging until the new year. Have a great Christmas season! 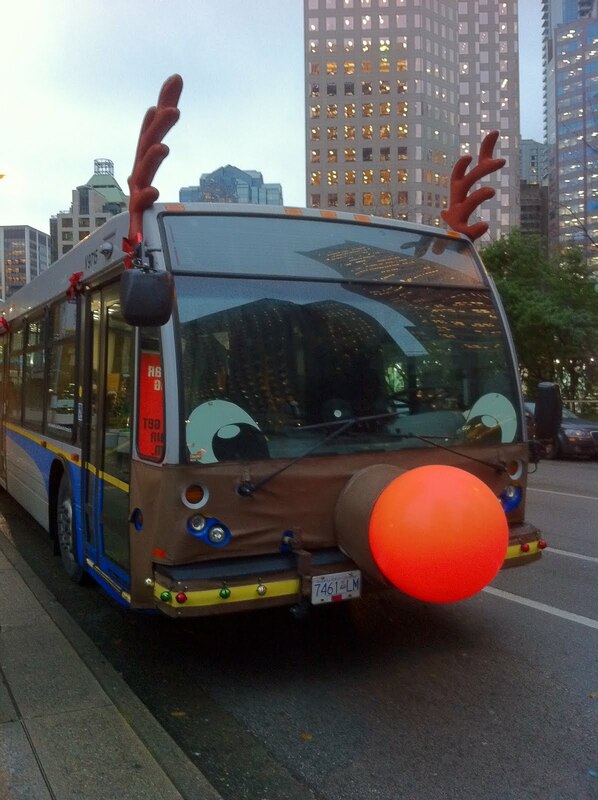 TransLink Reindeer Bus. Picture from rickie22. If you've never taken the Amtrak train down to Seattle or Portland, I recommend that you do. With Interstate 5 always under construction and always congested, taking Amtrak is a much more civilized way to travel and is inexpensive. If you are car-free like myself, the only option is to take Amtrak from Pacific Central Station in Vancouver as there is no station in the South of Fraser. If you own a vehicle, it is much more convenient to take the train from Bellingham as the train moves slowly through Canada due to our poor rail infrastructure. Efforts to get a White Rock stop for Amtrak passenger trains have so far failed, but a new push is now on to use Blaine's historic train station just a short stroll across the border. The idea is that Canadians – particularly from cities like Surrey, Langley and Abbotsford – could park near the Peace Arch border and board trains there to Seattle. "It would have heavy Canadian usage as they could cross the border by foot or bike even," predicts Bill Becht, one of the Blaine residents behind the campaign to restore the shuttered station. The issue has become urgent in Blaine since BNSF Railway applied for a permit to demolish the old station building. There is a website setup and a movement called Save the Blaine Station which aims to prevent the demolition of the station and see it back in revenue service. As a Langley resident, it would be great to see this station restored as I could take the pending TransLink Langley/White Rock bus to the US border and walk to the train station. Last week, I had to attend a meeting in Aldergrove and took TransLink from my work in downtown Vancouver to 272nd Street. The total time on transit was 2 hours and 20 minutes which is ridiculous. You actually have to pay for two fares as tickets only last for 90 minutes! While transit is clearly an issue in Aldergrove, one of the first things I noticed about the community was the half-dead Aldergrove Centre Mall. To be honest I have never actually walked through Aldergrove, but after last week I’m convinced that this mall is holding back the potential of the community. I did some research and found that the redevelopment of this site has been in serious discussion since at least 1998. In 2010, the Township updated the official community plan of Aldergrove to make the mall site a medium to high density mixed-use zone. I can't help but notice the similarities between the Aldergrove Centre Mall and the dead Cloverdale Mall. The interesting thing about the Cloverdale Mall site is that the City of Surrey is developing the site into something much better. 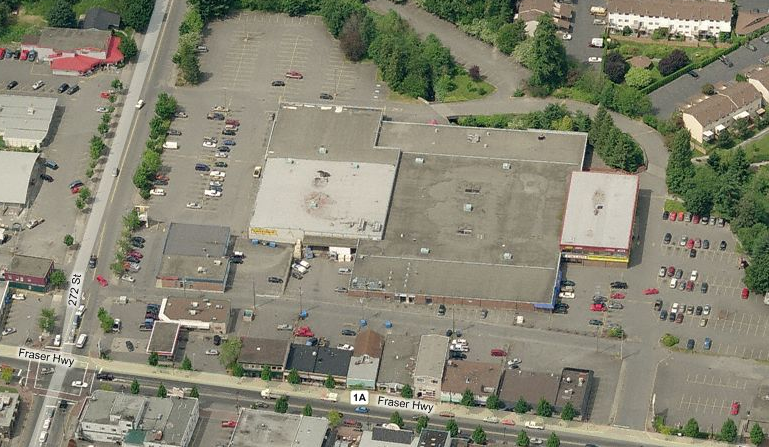 Is it time for the Township of Langley to take the lead and redevelop the Aldergrove Centre Mall site? Last week, I posted about Bedford Landing and noted that there was still some undeveloped areas on the east side of the project near the main Glover Road business area in Fort Langley. I mused how it seems like this area would be ideal for a mixed-use commercial area. Well I did some digging and found a report on Bedford Landing in the November 1, 2010 Township of Langley Council Minutes. While it looks like traditional retail space was frowned upon, Bedford Landing does have eight live/work units. This unit are actually pretty important because they can allow entrepreneurs and the creative class an affordable place to start up a business. 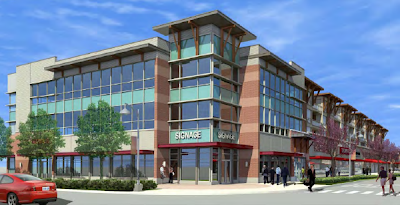 I know that some people in Fort Langley didn't want to see this development push through, but this development along with the new Fort Langley IGA is giving the area a much needed boost. 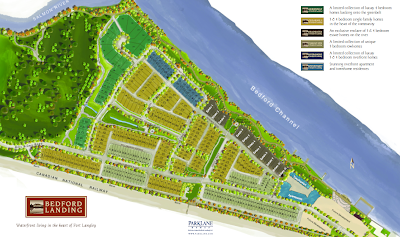 I was going through Fort Langley the other day and decided to take a look at Bedford Landing which is a new residential development with 278 single family and row houses, 8 townhouses, and 70 apartments units. Bedford Landing Site Plan. Click Image to Enlarge. One of the things that I noted about the project was the variety of housing choices within walking distance of each other: apartments, townhouses, row houses, small lot single family houses, and large lot single family houses. It’s actually a great example of how you can create a neighbourhood that has housing choice for everyone in different price points. Being located within an easy walk of the Fort Langley shopping area makes Bedford Landing a good example of a walkable neighbourhood. It’s also good that the riverfront is 100% publicly accessible. The only thing missing (and this is for Fort Langley in general) is transit service. The project is now complete, but there are a few lots that look like they would be perfect for a main street/mixed-use development. I know there are some in the community that don't want to see this happen, so it will be interesting to see was develops. The City of Surrey has been busy building greenways and their cycling network for a few years now. 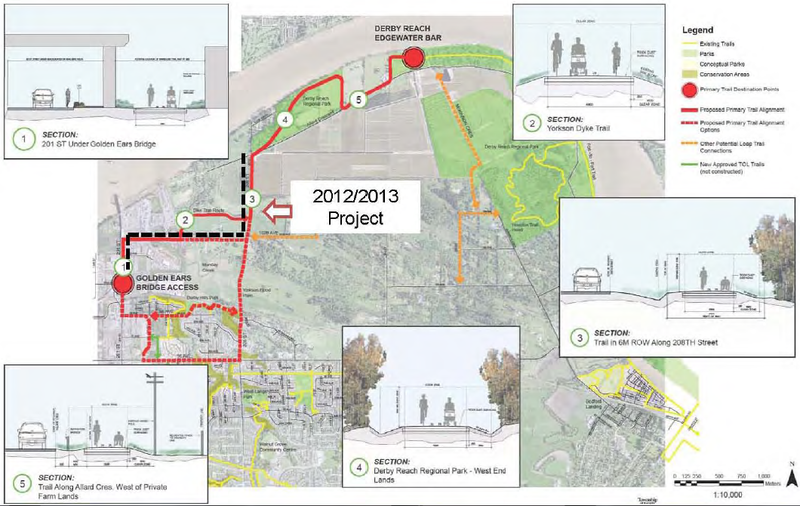 It looks like the Township of Langley is planning to connect up to Surrey's network and has applied for a grant to build a greenway trail connection from Derby Reach Regional Park to the Golden Ears Bridge. This project, if approved, would provide $500,000 of cycling and walking infrastructure improvements. Proposed Greenway. Click Image to Enlarge. For some time the federal government has been without a concrete plan to reduce GHG-emissions which has forced other levels of government to take the lead. Back in 2008 the provincial government announced the Climate Action Revenue Incentive Program, a grant meant to offset the carbon tax paid by local governments that have committed to the goal of becoming carbon neutral in their corporate operations by 2012. The Township of Langley signed on to this program. At yesterday afternoon's council meeting a report on the program and Township for 2011 was released (P. 49). -Completed twelve Power Smart lighting upgrade projects at municipal buildings. -Conduct a public school recycling pilot. All the projects are very encouraging to see, but I have the feeling that it's too little and maybe too late. What I find very interesting about the whole politics of climate change is that we can reduce our carbon foot print without affecting our way of live, yet there is so much resistance. In BC, transportation and buildings account for about 50% of our carbon foot print. Things like building district energy and building alternative transportation go a long way to reduce GHG-emissions and actually make our lives better while keeping money in our pocketbook. I don't get way there is so much resistance to things that make our lives better. It's time that the federal government step up to the plate and fund these green initiatives. 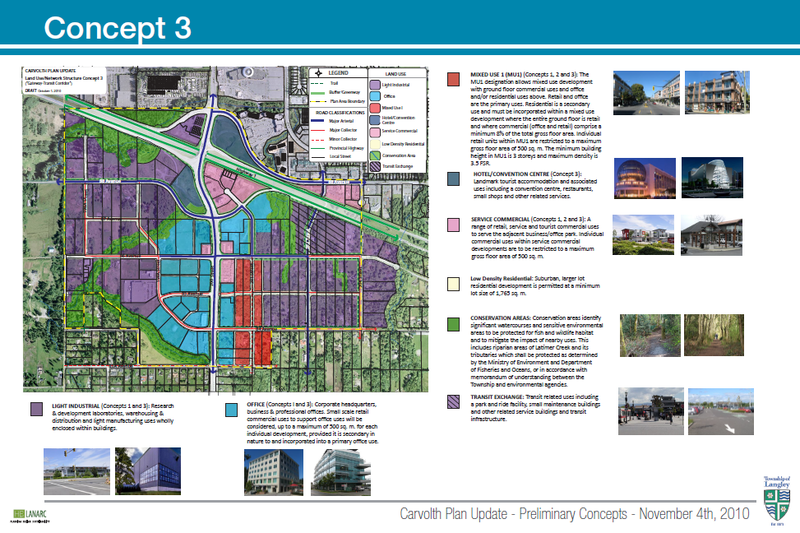 A month ago, I posted about Langley in Progress which is the Township of Langley's document that outlines development activity. I originally posted that it was compiled monthly, but it turns out that it's only released quarterly. Our very own Joe Zaccaria will appear before council this afternoon to put forward a Notice of Motion regarding the Langley in Progress publication. I will keep you posted on council's reaction. Therefore be it resolved that Council instruct relevant staff to compile and publically distribute “Langley in Progress” on a monthly basis and in tandem with the publication of the “Building Statistics Report”. I was chatting with a friend last night and we got talking about the urban/rural divide in Langley. 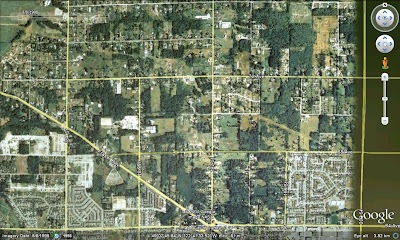 There has always been tension between the urban and rural in Langley, the classic example being the separation of Langley Prairie from the Township in the 1950’s to form the City of Langley. We were looking at the last election results and noted how the majority of voters are from outside of Walnut Grove and Willoughby as are the majority of those on council; I believe Michelle Sparrow is the only councillor from that area. This is not a slight at other councillors or even Township staff as I think of all the urban infrastructure and community centres (the Langley Event Centre) that got built with that dynamic, though I know all these things have come with great struggle. Going back to the 1990’s, it was even a fight to get the Walnut Grove Community Centre built. As urban Langley continues to grow, there will be even more pressure to build urban infrastructure and even more opposing pressure from those that are in rural Langley that don’t see the value. With the current dynamic of Township council will the rural voice weight more heavily? Will those in rural Langley value transit service, green boulevards, bike lanes, community centres, and libraries that primarily serve urban Langley? Will they see it as paying for someone else's services? I know there are some in Langley that want to see the City and the Township become one again. I think there is a higher chance of Willoughby and Walnut Grove becoming part of the City of Langley than an amalgamation to occur. While I’m sure the Township will find a balance, I feel that there will always been this urban/rural tension. While many support the idea of a sustainable region, some still don’t see how our built form fits into the equation. In the Township of Langley, there is even a group in Willoughby that is opposed to all development that isn’t single family housing. This same group of people also wants light rail up 200th Street or on the Interurban corridor. While people in other parts of the region might think that mixed-use et al is the only way to go, there is still an on-going debate in the South of Fraser. 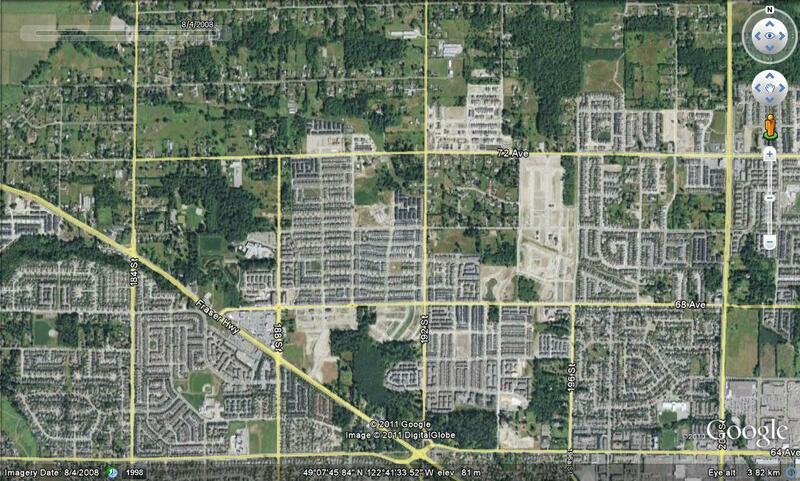 I actually had a planner from the South of Fraser tell me that he though that Smart Growth was basically stupid. On that note, I’ve been working on putting together a debate that will take place in the new year on sustainability. While I’m still working on the detail, I’ve got two great speakers lined up who will debate both the merits and challenges of Smart Growth development. I feel that this is an important discussion to have in the South of Fraser which is really the last frontier for greenfield development in Metro Vancouver. Stay Tuned! Since 1999 our region has been trying to build a fully funded transportation system that gives people the choice no to drive a car. First there was supposed to be a vehicle levy to pay for transit expansion which the NDP cancelled, then the BC Liberals restructured TransLink a few times to make it more “professional” and gave it the ability to become a developer, but still things fell through. I think the next two years will be a tipping point for transportation in our region: we are either going to get a transportation system that gives us real options like rapid transit in the South of Fraser or we will have another decade of business as usual. This time around, I actually thing we are going to get a system that give us options. When the mayors recently voted to increase taxation to pay for bus service expansion and the Evergreen Line, many said that there would be punishment at the polls. The reality is that this did not happen. With the vote to increase tax so close to the civic elections, I think many (including the Province) saw this as a referendum on alternate transportation. With the election out of the way and the pro-transit mayor emerging with a strong mandate, I think we are going to see a long-term funding solution for transit. I also hear that TransLink and the Province have the best working relationship in the history of the organization. Mayor Dianna Watts is rumoured to be severing her last term at Surrey City Hall and is looking for a light rail legacy. I also think that Christy Clark is looking for something big for the 2013 election. Could the South of Fraser finally get the transit is deserves? I think so! The big issue, of course, will be funding and I know that there will be a lot of whining by some in the press about "punishing the driver", but at the end of the day people (who drive, walk, take transit, and cycle) want better transit and are willing to pay for it. A while back, I posted about proposed improvements to McBurney Lane in Downtown Langley. Right now McBurney Lane, an aging pedestrian plaza, is cut off from Douglas Park by an ugly parking lot. 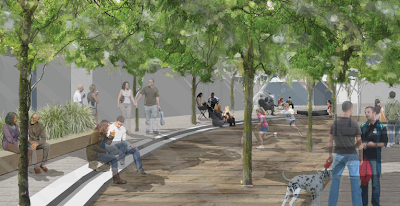 The design of the new plaza is meant to connect the lane to the park, creating a greenway of sorts between Langley's high-density residential area and walkable commercial core. Some in the business community are upset because the 21 stall parking lot will be removed and oppose the McBurney Lane redesign. The irony is that the City will actually be increasing parking in this plan. Even with the removal of the parking lot, there will be a net gain of 4 parking spots nearby. At the end of the day, Downtown Langley should be trying to attract the people that live in the City's high-density core which is within walking distance. The Langley Bypass is already serving the regional market. The new McBurney Lane will help create a sense of place and attract more people to Downtown Langley than the ugly parking lot. Proposed Design of McBurney Lane. Click Image to Enlarge. McBurney Lane, South. Click Image to Enlarge. McBurney Lane, North. Click Image to Enlarge. The Roberts Bank Rail Corridor Program aims to build up to 9 overpasses in the South of Fraser to allow more rail traffic to Deltaport. Langley is home to three of these overpass projects: the 192 Street, 54 Avenue, 196 Street “Combo Project”, Mufford Overpass, and the latest 232nd Street overpass project. Preliminary artist’s rendering of 232nd Street overpass. Click image to enlarge. I was talking to a friend yesterday about politics and young people in Langley, lamenting the fact that in local government it seems to be something for older people. In Langley, we counted the amount of people under the age 30 that are really involved in local government advocacy and politics. We could barely fill a hand. Why is this? I know that many of my peer-group run to Vancouver as fast as they can because they feel that Langley isn't a community that shares their ideals and desires for an vibrant, urban environment; it's suburbia to them. A friend of mine who is engaged in Vancouver issues (he moved from Langley to Vancouver) told me, "I'm just a boy who enjoys frequent transit, a solid grid network and mixed-use development"
When young people do run for local government out here, they run into ageism. As another friend from Abbotsford said, “what experience do young people have to draw on? 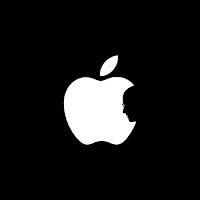 Very little - idealism and noble sentiments only go so far.” I have a feeling that many other people feel the same way. The thing is that we do need some fresh ideas, otherwise we end up with government that runs on the status quo. The last time I checked, the status quo isn’t working. Would a younger person be more interested in preserving green-space, building a sustainable community, engaging young people, and investing in aging infrastructure? I think so, after all it’s our future. Looking back at previous councils in Langley, young people are far and few between. Is politics truly only for old people in Langley? Is it really good that many young, engaged citizens want to leave Langley as soon as? What would it take to change the mentality out here? With the Evergreen Line looking like it will finally be built as a SkyTrain extension, I was poking around the internet to find information about when it was going to be built as a light rail line. I came across a document from 2006 on the BC Environmental Assessment Office's website about the original plan. The original Evergreen Line. Click image to enlarge. -A travel target time of 20 minutes between Coquitlam City Centre and Lougheed Town Centre Station. -Ten stations with nine stations identified and two candidates for the potential additional station (Cameron station – at-grade on North Road at Cameron Street and Douglas College – at-grade on Pinetree Way at the entrance of Douglas College north of Town Centre Boulevard). -A maximum capacity delivered of no less then 2,500 passenger spaces per hour per direction at the maximum load point in the year 2010 and 3,500 passenger spaces per hour per direction at the maximum point in the year 2021. -Off-street bus facilities at four stations. -A maximum allowable headway time of six minutes between trips during peak hours (and 15 minutes between trips during the early morning (before 6:30 am) or late night (after 11:00 pm) service times). -Stations designed to reflect the application of the Crime Prevention Through Environmental Design (CPTED) standards. -Potential Future Extension to the City of Port Coquitlam. -A start of construction date scheduled for September 2007. -A start of operations date scheduled for September 2011. Of course we all know that the Province changed the system to SkyTrain on a dime and I'm a bit concerned about the current planning going on for rapid transit in Surrey. You see, TransLink selected light rail for the Evergreen Line after doing an "analysis of rapid transit alternatives for servicing the northeast sector. A multiple account evaluation of the alternatives was carried out and considered factors such as capital and operating costs, ridership, travel time, the fit with urban development plans, community effects such as noise and aesthetics, potential environmental effects and ease of implementation." This is the same thing that TransLink is doing right now for the South of Fraser. If TransLink completes the rapid transit study and selects a technology other than SkyTrain, I have this fear that we'll end up with SkyTrain and a project that instead of being built in the next 10 years, will be built in the next 20. Maybe things have changed, but it seems that whenever the region chooses a cost-effective rapid transit system, we end up with SkyTrain. So CBC News did a poll on what people think about transportation infrastructure and how they are willing to pay for it. As was evident in our recent municipal elections, there was no backlash or “punishment at the polls” for mayors that voted to improvement transit in our region. In fact, our region seems to be willing to have a mature conversation about implementing a user-pay system to pay for our roads and transit. CBC News asked the questions “What will help reduce the time spent on the daily commute?” The majority of Metro Vancouver residents said that transit improvement will reduce congestion and only 26% of residents thought that building more roads will reduce congestion. Also interesting is that the majority of residents would consider not driving if public transit was improved. What I found really interesting is that only 41% of people in Vancouver think that “my local government has enough money to pay for road and public transit improvements”, yet 79% of people think that “I pay enough taxes to cover the cost of maintaining roadway infrastructure and building new roads / bridges as needed”. This either means that people are willing to pay for more public transit and not new roads, or that people don’t want to pay with taxes and would rather go to a user-pay system. When given the option of how to pay for improving transit infrastructure people thought that the federal government should be paying its fair share which isn’t happening today. Barring that in Vancouver, a congestion charge (variable road tolling) or just road tolling was the preferred way to pay for transit and roads. Only 33% of Metro Vancouver residents do not support the concept of tolling. I think that South of Fraser mayors like Peter Fassbender who are taking about road pricing to pay for transportation are on the right track as people don’t want to be tax indirectly for it. I certainly hope that our region's mayors can find a solution to pay for improving transit and getting rapid transit out in the South of Fraser. If you're like me, and there is a good chance if you're reading this blog, you are a bit of a transit geek. I was browsing through TransLink's website and came across a document called Expo Line Upgrade Strategy. While it is interesting to see what the future may hold for the Expo Line, I was particularly interested in the stats about the line. 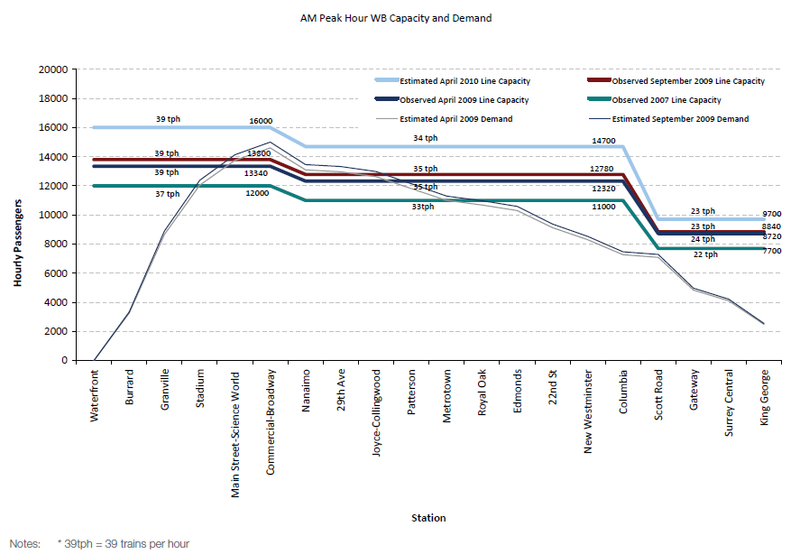 Estimated Maximum Demand versus Line Capacity. Click Image to Enlarge. While looking at the previous graph, it's easy to see that Commercial-Broadway is the busiest station in the system. It also has the most pass-ups. Observed Pass-Ups in April 2009 and September 2009. Click Image to Enlarge. While reviewing the report, I found that it makes no mention about how the new fare gates affect the system and will actually reduce the people per hour that can access the system. Stations like Metrotown have to be complete redesigned because of this. It's not very often that a transit agency installs something that reduces the capacity of the system. The total package of upgrades in the report totals about $1.1 billion. This is a hefty price tag and does not expand access to the system in places like Surrey. With the election over and done, it has become clear that people are happy with the direction that our local governments are taking in building more sustainable communities and providing transportation choice in our region. Some in the media stirred the pot claiming that people have had enough of bike lanes in Downtown Vancouver or better transit service in the rest of the region. If the results of this election are any indication, people are ready for transportation choice and in the South of Fraser are ready for light rail. The biggest change was in the Township of Langley where the voters clearly had enough of Rick Green’s style of politics and vision for Langley. The future for a sustainable Langley is very bright and I’m hopefully that we will see positive change in the next three years. This came into my inbox yesterday and I thought I'd pass it along. Langley MLA Mary Polak is hosting her sixth Twitter Townhall on Friday, November 18 from 3:30 to 430 p.m. Transportation continues to be a key priority for Langley residents and so, Mary would like to hear from residents on this issue. She would like to extend an invitation to you to participate in this townhall. Government works better when you are involved in it so, please let us know whether you will be able to tweet a question and participate in this important conversation. 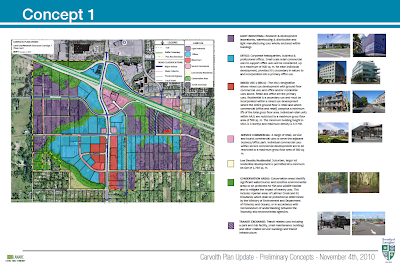 Yesterday, I talked about how the Carvolth business park area in the Township of Langley may be transformed because of the construction of the new 202nd Street Park and Ride. I thought I'd share some more information on the Park and Ride. I took these pictures of the new underpass that will connect 88th Avenue to the Park and Ride a few weeks ago. 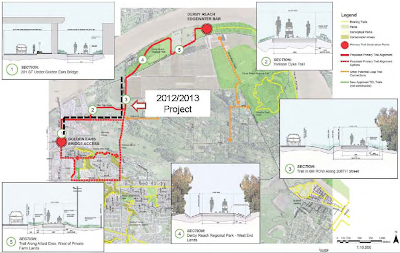 -A new pedestrian and cyclist trail connected to the Langley trail system. 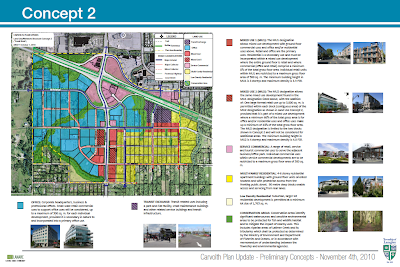 Carvolth Plan Update - Transforming a planned business park? 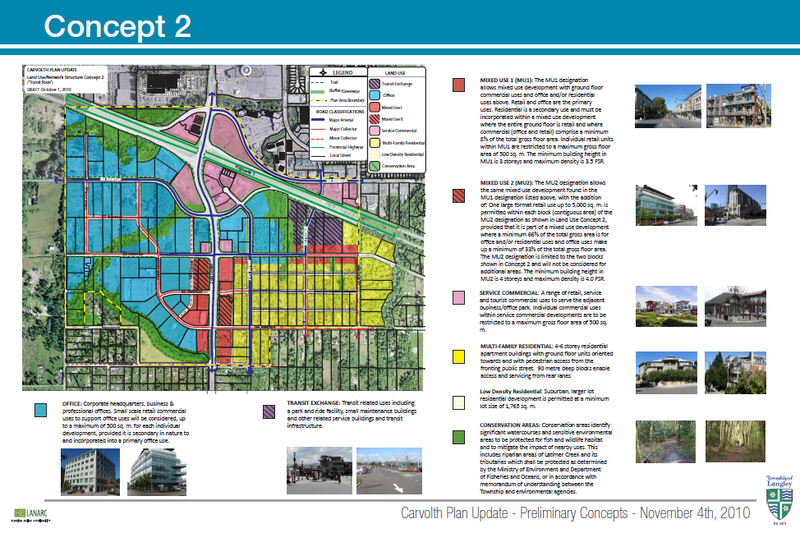 This morning I was getting all depressed about the lack of walkability in Willoughby, when I came across the Carvolth Plan Update on the Township of Langley’s website. 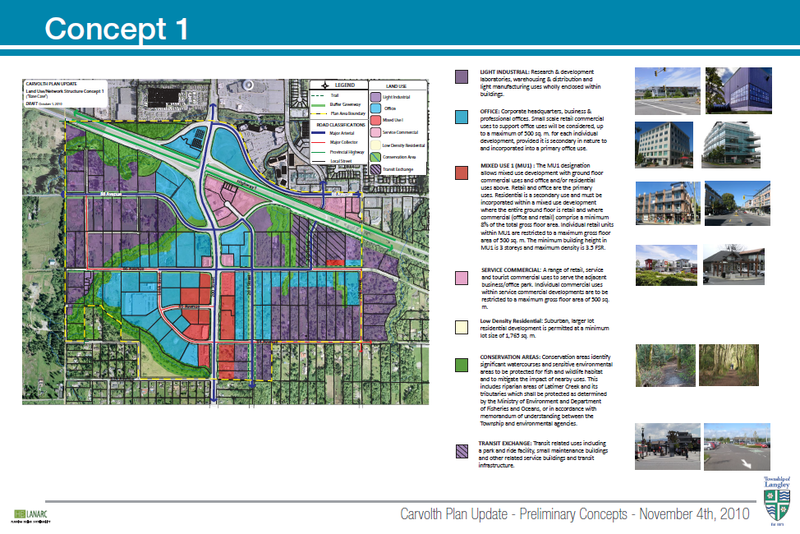 With the announcement of the 202nd Street Park and Ride, Golden Ears Bridge completion, and recently adopted high-density development policies, in March of 2010 Township staff started a process that ended with an open house that presented the following three options in November 2010 for Carvolth. 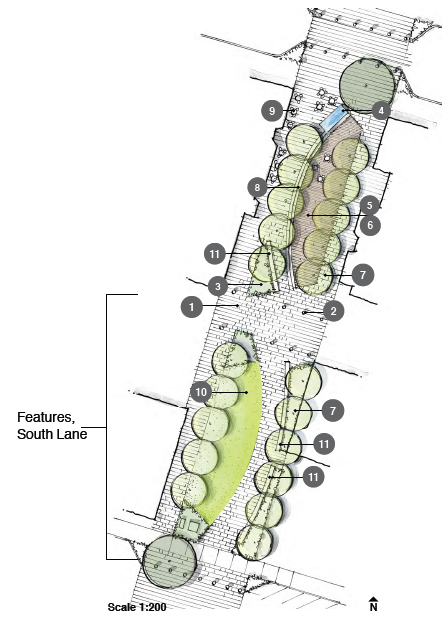 Concept 1, Base Case: This option substantially reflects the existing policies in the Carvolth Plan, with minimal change. Select image to enlarge. Concept 2, Transit Node: This option takes advantage of the Transit Exchange near 202 Street and 86 Avenue and proposes a transit-oriented urban village in the area. Select image to enlarge. 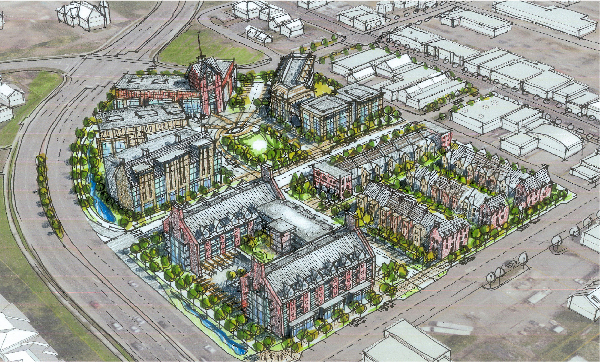 Concept 3, Gateway-Corridor: This option features gateway and landmark developments at the interchange and pedestrian-oriented uses at key locations along 200 and 201 Streets. Select image to enlarge. The Base Case option reflects the existing policies in the Willoughby Community Plan. While this option retains much of the plan area for employment uses, it maintains a street network made up of very large blocks and assumes internal access and circulation within individual developments. 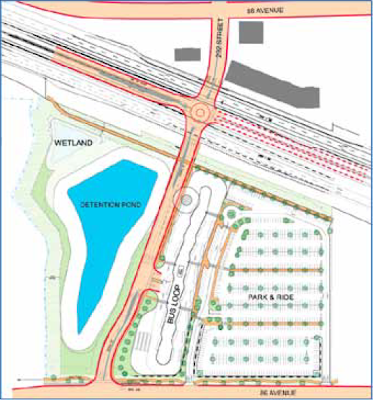 The Transit Node option takes advantage of the Transit Exchange near 202 Street and 86 Avenue and proposes a transit-oriented urban village in the area. It introduces a significant amount of residential capacity in mixed residential-commercial use and multi-family apartment buildings within walking distance of the Transit Exchange. Additional roads are proposed to accommodate additional traffic anticipated for higher intensity of land uses. 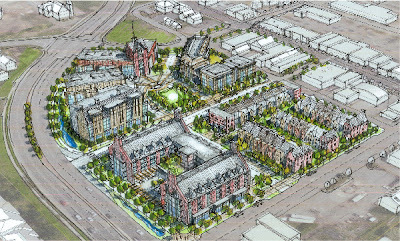 The Gateway-Corridor option aims to encourage gateway and landmark developments at the interchange and pedestrian-oriented uses at key locations along 200 and 201 Streets, while retaining significant employment capacity for industrial and office uses. 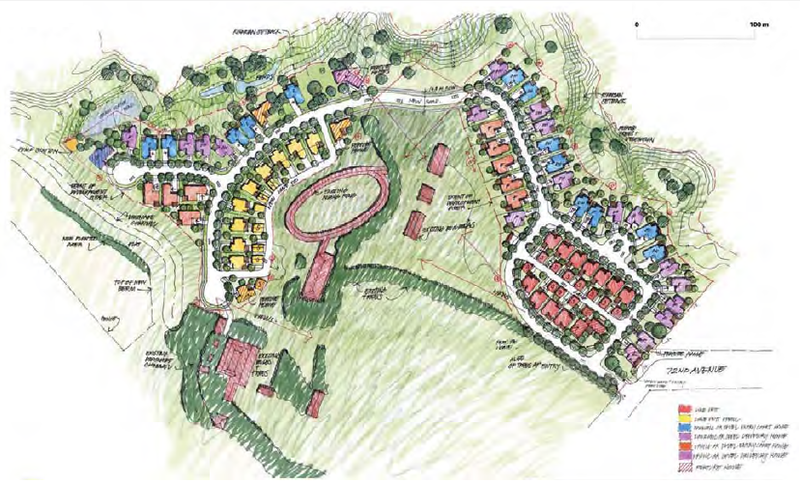 Based on the results of the open house, a new Carvolth area plan was supposed to be presented in January/February of this year for council’s consideration. Interestingly, it appeared that the process went dormant in 2011. I email the friendly staff at the Township this morning and was told that they will have a report to council on a preferred land use option in the first quarter of 2012. I really like option 2 and I’m hoping I won’t end up being depressed again about the lack of walkability in Willoughby. Light Rail for Surrey and Langley closer than we think? “I recognize that Surrey is growing quickly and understand how important transit connections to the community will be as we work to build a more efficient and effective transit network in the Lower Mainland,” the letter said. Surrey is exploring light rail transit routes along 104th Avenue between 152nd Street and City Centre; City Centre to Newton, with an extension to South Surrey; and along Fraser Highway, between City Centre and Langley. Fassbender said a transportation study is already underway and he expects work on a route could begin as early as next year. What is interesting about this article is that the Province and TransLink are talking about building rapid transit in Surrey and the City of Langley with money from the gas tax and future long-term funding solution in the next few years. Also interesting is that there isn't much talk about the Township of Langley. One has to wonder if it has anything to do with the adversarial approach that the current Mayor of the Township has taken with TransLink and the Province over transportation. It is also good to see that the Province is talking about building rapid transit in the South of Fraser ahead of or at the same time as the UBC SkyTrain line. This well help shape the South of Fraser into a more sustainable area. It would be a mistake to wait any longer to build rapid transit in the South of Fraser as the sub-region is in the process of a massive renewal of first-generation suburbia. At this point it can go either to more suburbia or to a sustainable, walkable region. I believe that the next decade will set the path for the South of Fraser for the next 50 years and that is why we have to build a transportation system that gives people choice. Statistics Canada has a great study on Households and the Environment. It's a 96 page document, but well worth the read. I wanted to point out some of the highlights. When it comes to drinking water, the proportion of households that drink primarily bottled water has dropped from 30% to 24% in 2007. Also, 63% of households have low-flow shower-heads and 42% have low-volume toilets. With heating and cooling, about half of Canadian households have programmable thermostats, but only half of them actually use the programmable features to lower temperature when they are sleeping or are away. Interestingly, only 3/4 of household have at least one CFL bulb while 64% of us use a clothesline or drying rack instead of a energy wasting drier. -More than half of the households that had expired or leftover medication (57%) returned the medication to the supplier or retailer for disposal. -Most households (62%) took or sent their unwanted paints and solvents to a depot or drop-off centre. -Thirty-six percent of Canadian households had unwanted electronic devices to dispose of in 2009. -Twenty-two percent of Canadian households reported that they had dead or unwanted compact fluorescent lights to dispose of, of which over half (56%) reported they put their dead or unwanted CFLs in the garbage, while 24% reported they took or sent them to a depot or drop-off centre. If you are a glass-half-full kind of person, looking at this report is rather encouraging. There are about 50% of households that can be changed to be more environmentally friendly which will have an huge positive impact on the environment without having to make any drastic changes in lifestyle choices. As part of our 2011 municipal election coverage, we sent out a questionnaire to all the mayoral candidates running in the City and Township of Langley. We will post the responses in the order they are received. Today we will be posting the reply for Township of Langley mayoral candidate Mel Kositsky. What got you interested in politics and local government? I covered politics and councils in Langley as a reporter since about 1976 and decided to run for office in 1993 and was elected. Why did you decided to run for mayor this election? It was time for me to bring back trust, respect, and civility to the Mayor's office. What are your priorities for the next council if you are elected? See website - Orderly growth is key to other priorities. What are your unique skills that would be valuable on Council? Trust and proven leadership in municipal organizations and communication skills. What is do you think is/would be the most challenging aspect for you sitting on Council? Financial constraints in a growing community with so many needs. Why should somebody vote for you over the other candidates? Proven leadership and knowledge of local government. What do you love about Langley? Green space - parks and agricultural lands. What are some of the challenges that Langley faces and what do you plan to do to address those challenges? Changing demographics and increased urbanization - Already started with the Langley Diversity Program and Regional Growth Strategy. How do you think that Langley can meet its Sustainability goals? We have a well developed Charter of Sustainability that we are following. How do you plan on striking a balance between keeping taxes low and improving service? Create a long range financial strategy that can be reviewed annually based on global economic conditions. With TransLink now looking for long-term funding, what are some of the option that you think should be explored? The recently approved 2 cent per litre gas tax should help. Not in favour of more property tax increases. Last year I wrote a report on the Agricultural Land Reserve in the South of Fraser. One of the alarming trends that I noticed was tricky ways people were getting suburban development approved within the ALR. The Agricultural Land Commission will allow non-farm uses within the ALR which makes it look like the ALR isn’t shrinking when it really is. Back in 2001, the ALC denied an application for a non-farm use suburban development at 72 Avenue near Glover Road and Highway 10. In 2007, the Wall Financial Corporation applied again and was granted a conditional approval for their non-farm use application for what is being billed as an equestrian community. The problem with developments like this, besides weakening the ALR, is that they negatively effect Langley’s path to sustainability. High Point Equestrian Estate Community, Gloucester Industrial Estates, and now this proposed development will never see usable transit service and will never be complete walkable communities. If you live or work in these areas, you must own a car and you must drive to everything. They are development literally in the middle of farmland. 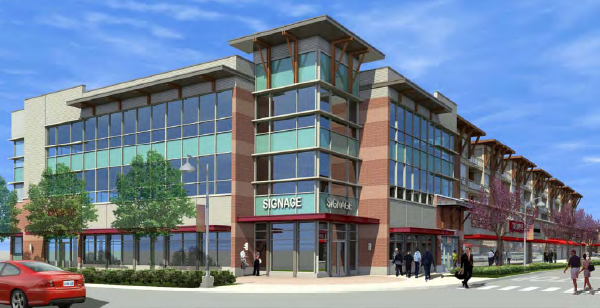 The Township of Langley can't complains about lack of transit service in certain parts of Langley if it keeps approving these kinds of developments. Langley Township should be focusing its development efforts in established community and Willoughby and not allow these “one-off” suburban development in rural Langley because if this is allowed to continue Langley’s ALR and rural character will die a death by 1000 cuts. We support the direction with the proposed improvements to the MMAP as referenced in Health Canada’s June 17, 2011 document. We agree that due consultation with all stakeholders is absolutely essential to improve the MMAP and that adequate time must be provided to licence a sufficient number of companies who can supply the amount of dried marihuana required by Program participants. Ideally, we would like to see Program participants be able to access medicinal marihuana like any other prescribed drugs through licenced pharmacies. We would also encourage Health Canada to expedite the federal regulatory process to implement the improvements as soon as possible so that Program participants do not have to wait until 2014 before they can take advantage to the improvements. Interesting Randy Caine, who is running for City Council and is the operator of the dispensary, has been charged with possession exceeding three kilograms for the purpose of trafficking according to the Langley Advance. Cooke said the police maintain that many of the dispensary customers were not licensed by Health Canada and he questions the source of the marijuana. By all accounts it looks like this might be shaping up to be one of the election issues in the City of Langley. The City of Langley, in conjunction with the Royal Canadian Legion Branch 21, invites the public to attend the Cenotaph Dedication Ceremony on Wednesday, November 9th, 2011 and the Remembrance Day Ceremony on Friday, November 11th, 2011 in Douglas Park. Members of the Langley Legion will host the Cenotaph Dedication Ceremony on Wednesday, November 9th at 2:00 p.m. in Douglas Park, 20550 Douglas Crescent. This Dedication will recognize the newly constructed monument as a symbol in recognition of the sacrifices of those who have and who continue to serve our country during times of war and peace. To follow up to last week's post about transportation funding in Langley, I thought it would be good to compare Langley to a community like Abbotsford that "goes-it-alone". If we forget about road improvements in 2010 Langley received $16.2 million in transit service. In 2010, Abbotsford received $8.1 million in transit service. $124.19 per person is spent on transit in Langley. $58.45 per person is spent on transit in Abbotsford. I know there has been a call from some in the South of Fraser to start our own transit agency. I don't see the benefit. 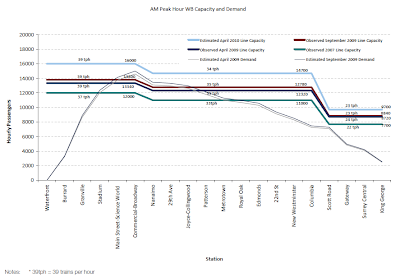 Metro Vancouver has the best transit service in the province and our mode share data shows that. More people use transit in Langley Township than Abbotsford because as a region we a care about providing transportation choice and as a region we are able to lobby seniors levels of government to find ways to improve transit. If we created a South of Fraser transit agency, we would have less transit dollars, would have worse transit service, and would have a weaker voice. A review of the data has shown that there is no engineering warrant to signalize this intersection, but accident statistics are high enough to warrant consideration of design elements to reduce conflicts. 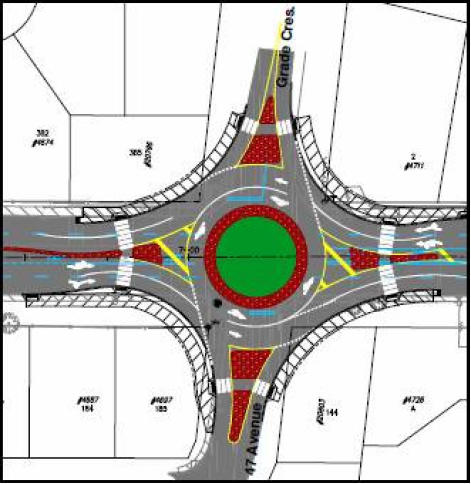 The 47th Ave/Grade Crescent and 208th Street has several issues precluding the use of a roundabout in addition to a prohibitively high construction cost (due to property acquisition). Based on the review of all available data, staff working with ICBC, have concluded that from a traffic operations and safety perspective Option B is the preferred option. As you can see, option B is the median. Not to worry, staff's current recommendation is to do nothing for now. 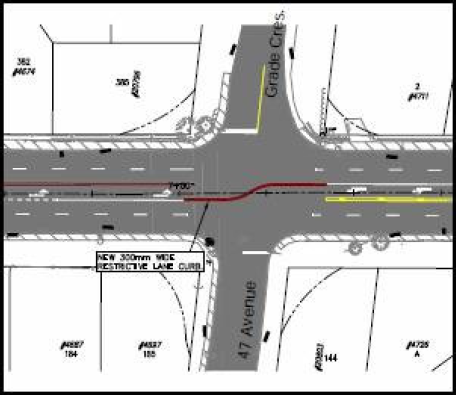 Once the 48 Avenue re-construction is complete and the Master Transportation Plan update is complete, staff will re-assess the options for the intersection of Grade Crescent/47 Avenue at 208 Street and bring forward another report for Council’s consideration. I received this in my inbox and though I'd pass it along. NOVEMBER 5, SATURDAY - 1:30 to 4:30 p.m.
Newton Library, 13795 70 Ave.
NOVEMBER 13, SUNDAY - 1:30 to 4:30 p.m.
Fleetwood Library, 15996 84 Ave. Hear what City Councill candidates have to say. There will also be opportunities to question these candidates. As part of our 2011 municipal election coverage, we sent out a questionnaire to all the mayoral candidates running in the City and Township of Langley. We will post the responses in the order they are received. Today we will be posting the reply for Township of Langley mayoral candidate Jack Froese. Jack Froese has lived, worked and raised a family in Langley for 32 years. Jack Froese demonstrates leadership and grew his local business 40 times since the first years in vegetable and nursery production, commercial egg farm, and eventually a turkey farm. JD Farms grew to wholesale distribution throughout British Columbia including retail agri-tourism on farm store. Jack was nominated in 2009 as “Business Person of the Year” awarded the TAB Board 405, “Member of the Year”. Jack Froese completed a 19 career with the Vancouver Police Department in 2004 where he worked in patrol, community services, collision investigation and on the waterfront. Jack Froese contributed hundreds of hours in community service. A sample of his contributions are: Served as director on the Fraser Valley and BC Egg Producers Association Special Constable with the Langley RCMP auxiliary, Soccer coach for 15 years in the Aldergrove Soccer Club, Served on the executive of the Aldergrove Soccer Club, Served on the executive of the Fraser Valley Girls Soccer Association and is a past president of that organization. Past director of the Greater Langley Chamber of Commerce, currently a member, and past president of the Rotary Club of Aldergrove. Served as Director of Security for the 2010 Township of Langley BC Summer Games. As is consistent with my volunteer experience, serving on council is another way I want to give back to my community. I have been considering running for local government for a long time and now the time in my personal and business life permits me to run for Mayor. Why did you decided to run for council this election? I have witnessed the turmoil on council over the last 3 years under the present Mayor and believe that I can bring the necessary leadership skills and more accountability to council. Initiate an annual strategic planning session that includes the leaders of our Langleys. Included would be school board, our MLA's, our MP, and the City of Langley. Initiate a transportation advisory board to address the transportation issues facing Langley both within the township and regional issues that impact Langley. Expand economic development in Langley to increase our economic base and economic activity. Bring accountability to the office of mayor. 20 years as a Vancouver Policeman and over 30 years building a successful business has provided experiences in conflict resolution, negotiation, labour issues, financial management and leadership. Reaching consensus with the community on complex issues. There are many divergent points of view on many issues that can be challenging for council to appease everyone while addressing the needs of the community at large. I bring a lifetime of experience from the business world, public service as a police officer, over 32 years living and volunteering in the Township of Langley. The sense of community spirit. A good example was the 2010 summer games when thousands of people volunteered to bring the most successful games ever to Langley. The rural flavour of Langley also gives our community a unique environment. Langley is growing and needs careful planning to address the future needs of the residents. New developments have to be planned to allow for sustainable and liveable neighbourhoods. Bus networks, pedestrian and bicycle friendly neighbourhoods and roads are a priority. I will work with our planning department and the businesses that develop Langley into the type of neighbourhood that we want. Involvement of the community and the leadership from council will keep the goals on track and moving forward. Annual reporting to council on the progress of the goals will provide direction on addressing issues as they arise. A commitment from council to achieve our goals and set new ones must continue. Every service has a cost and benefit. Taxpayers needs must be addressed by providing the necessary services while looking at where our tax dollars go. Setting a goal of maintaining taxes at the rate of inflation is a good place to start, but the needs of the community must come first. Langley is in a period of growth and the costs to grow put pressure on keeping taxes low. A long term, balanced approach to providing new services and improving existing services must be taken. Tolling bridges that is fair and evenly distributed would alleviate congestion on bridges that are not tolled while tolled bridges are under utilized, this could also add revenue to the transit system. A funding system that does not put added pressure on residents that do not get the transit services, such as in rural Langley. Gas taxes need to be a part of the funding, but at the present levels, not increased. More emphasis should be placed on taxation systems that spread the burden more fairly, like a percentage of the sales tax or property taxes which impact everyone, not just those that must rely on their cars. One of the pastimes in Langley is to complain about TransLink and the level of service it provides to the community. There is a common belief that Langley taxpayers are not getting value from the agency and are actually subsidizing Vancouver’s transportation needs. What I found interesting is no one has actually looked at the amount of money that TransLink spends in Langley. These numbers don’t include insurance or capital costs. At the same time in 2010, Langley City and Township contributed $15,321,538 in property tax and an estimated $16,000,000 in gas tax to TransLink. If you think that $15 million is leaving Langley for Vancouver transportation, think again. In 2010, TransLink spent $2,295,098 on the major road network in Langley and cut a cheque for $90 million for the Golden Ears Bridge. Even when you factor in the $29 million in toll revenue from the Golden Ears Bridge, it turns out that TransLink subsidized the bridge by $61 million. So in 2010, TransLink actually contributed more to Langley in transportation (about $45 million more) than it took in. Let’s not forget that Langley citizen also use SkyTrain, the West Coast Express, and other regional transportation infrastructure. The point of this post is to wake people up to the fact that TransLink isn’t screwing over Langley. At the end of the day, we are getting more from being in TransLink than if we went it alone. The reality is that if we want better transportation in Langley, it comes at a cost. As part of our 2011 municipal election coverage, we sent out a questionnaire to all the mayoral candidates running in the City and Township of Langley. We will post the responses in the order they are received. Today we will be posting the reply for City of Langley mayoral candidate and incumbent Peter Fassbender. My wife and I have lived in Langley City for over 35 years now and raised our two sons here and now have three Grandsons who all live in the City of Langley. Prior to running for Council 9 years ago I had a successful business career in the Advertising/Communications field. I was one of the partners in one of Canada’s most successful Advertising/Communications firms. Aside from my role on Council over the years I served as a Trustee on the Board of Education for two terms and have served on a number of other committees and volunteer groups. In the past I have served on Parks and recreation, Advisory Planning, Board of variance to name only a few. I also have been active on a number of other committees Provincially, Nationally and Internationally. Ever since we moved to Langley over 38 years ago I have always volunteered and served the community in many ways. Additionally I served in a number of other capacities such as a director and then President of Sport BC, the Canadian Sport federation and the COA. As such I was fortunate to be able to contribute in a variety of ways and in a number of positions. As a result people in the Community saw that I was willing to step up and be a contributor. These opportunities also helped me understand “public Service” and what that really meant. People noticed my commitment and then approached me to consider running for elected office starting as a School Trustee and then eventually City Council. I also ran for Municipal Council in the 70's but was not successful at that time. I have always been interested in the political process and worked to help make it work! Having served for nine years on Council, six as Mayor, I believe I have demonstrated my desire to contribute to the community. I have shown a strong work ethic and have been actively engaged in every aspect of our community and the Region. To continue to build upon our Community Master Plan, work on Crime Reduction Strategies. Transportation for our community and our Region. I think I have clearly demonstrated that I have a strong work ethic, management skills, consensus building to name only a few. I have an will continue to have an “Open Door” policy. Most importantly I believe I have proven that I have the best interests of all our Taxpayers and citizens in mind. I am not afraid to make decisions that I truly believe are based on the needs of the whole community. There is no one challenge that sticks out more than others. The role of Mayor is to work with Council and staff to make well thought out decisions that balance all the needs of the community. I think they should look at my record and determine for themselves if I not only talk the talk but walk the walk. There are many things, not the least of which is the great community spirit that we have and the sense of belonging to a community that cares. It is one of those intangible items that has tangible benefits for everyone. Redevelopment, Transportation, Public Safety and Fiscal Management are the key challenges. I would continue to put both my skills and dedication to work to ensure that we continue to move forward in a positive and productive fashion. If we work hard, be willing to manage change and be proactive, we can find ways to be sustainable while balancing the needs and desires of our community in a fiscally responsible manner. We need to make sure we hear from our citizens and various special interest groups and determine what are the essential services they need and then balance those with our ability to pay for them. We need to work hard with our staff to always look for ways to tighten our belt. How we work with our Unions to negotiate our collective agreements will also be very important as wages are our single largest recurring costs. I do not think there is one option that will meet our long term needs. We need to finds ways to raise the capital we need to expand infrastructure and then we need to find ways to fund the ongoing operations. I believe that they will be different sources. Using Carbon tax revenue, Road Pricing, and other more user pay sources are high on my priority for the future. I do not see Property Tax as the sustainable source of operating funds and as such I would eventually like to see the reduced if not eliminated as a funding source. We also need to find sources that will ensure Regional equity so no one region carries the major burden on such things as tolling bridges etc. For that reason we should explore such things as putting tolls back on all other existing structures and thereby lower the toll on all of them to a more reasonable rate. One of the things that people think of when you mention Surrey or Langley is suburban sprawl. 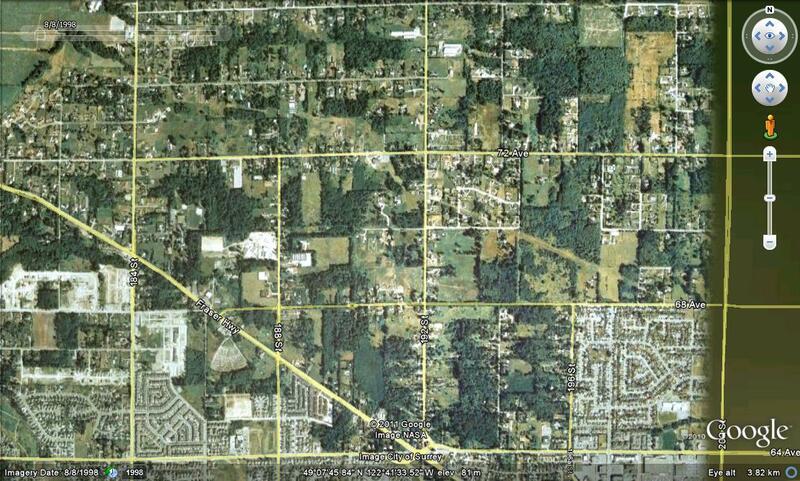 I was using Google Earth's history feature and took a capture of East Clayton/200th Street in 1998 and 2008. Looking at this, you can actually see that 1st generation suburban development is being replaced by a much higher density urban footprint. Because the Agricultural Land Reserve protects Langley and Surrey's rural areas, we see a more urban development pattern. Clearly there is still many improvements that need to be made to our built form and you might even be able to call what is being built today urban sprawl, but it's not certainly not suburban! At yesterday afternoon's Township of Langley council meeting TransLink gave a presentation on a proposal for new transit exchanges. Alternative 4- frequent services from the west serve Willowbrook and terminate in downtown Langley City; frequent services from the north terminate in downtown Langley City; services from the south, east and northeast serve downtown Langley City and then terminate in Willowbrook. TransLink has determined Alternative 4 to be the preferred alternative in terms of meeting customer needs, supporting urban development and maximizing compatibility with future rapid transit on Fraser Highway. This option requires two exchanges, although they would be smaller than a single terminal. Buses serving Brookswood, Murrayville, Aldergrove and Fort Langley would stop at the downtown Langley City Transit Exchange prior to going to the Willowbrook Exchange. Frequent service buses on 208 Street would terminate in downtown Langley City. TransLink is looking for $50,000 from the Township to complete the concept and area plan for the Willowbrook Transit Exchange. The whole project is being cost shared with TransLink and the City of Langley. I was told that Mayor Green did not support this study. A few weeks ago, I posted about a new 20-acre new mixed-use development for the Yorkson area in Willoughby at 208th Street and 80th Avenue. 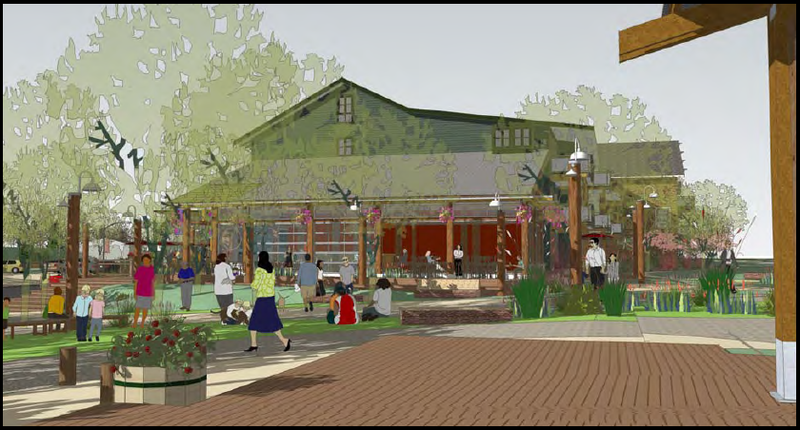 In tonight's Township of Langley Council Agenda, there are a few renderings of the project which I've included in the post. I think this is existing because there will finally be a mixed-use community centre in Willoughby which is sorely needed. While the majority of this project is focused along a High Street, it is interesting that this development is turning its back at 208th Street. 208th seem to serve as the parking lot for a part of this project. I have to wonder if this is how most development are going to look in Willoughby and if 208th Street will basically be a highway. Chicken and egg: transit service levels. One of the classic transit chicken and egg situations is around the frequency of service. Infrequent transit service seems to be underused while frequent transit service seems to always be busy. Is infrequent service underused because it is infrequent or because there is no demand? Likewise with frequent transit service, it seems like there is never enough services once you get 15 minutes or better frequency. I had a chat with a transportation planner and one of the things that has never been done in Metro Vancouver is to use the regional transportation model (computer software) to see what would happen if transit service was up on all routes to frequent service level. It would be an interesting experiment to do especially since TransLink now has a whack of service hours to deliver into the South of Fraser. I would be interested to see how many of the current underused transit routes in the South of Fraser become busy. On October 6th, Mayor Rick Green of the Township of Langley found himself on the wrong side of history. He issued a press release opposing TransLink’s Moving Forward plan and in the process opposed having RapidBus service at the Walnut Grove Park and Ride, improved service in Walnut Grove, improved service in Willoughby, and improved service in Brookswood. Besides opposing the plan, the real issue is the adversarial tone with the Province. People being people, when the Province comes to town with a cheque will the Township be first in line? Another issue I had with the press release was the twisting of facts. Gloucester Industrial Estates, a 700 acre industrial park with 8,000 to 10,000 employees a day going in and out of the park. Property owners in Gloucester submit $1.4 million per year for absolutely nothing. It is indefensible. 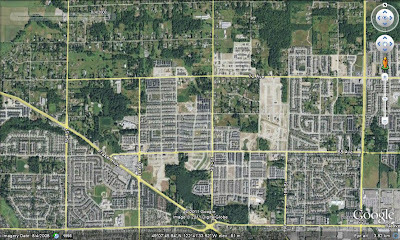 Beside a large vacancy rate and the fact that a large number of employees come from Abbotsford (which is not part of TransLink), the real issue with Gloucester is that it’s a business park literally in the middle of nowhere and is probably the least transit friendly development in our whole region. Conventional bus service would be a real challenge. For example, the $1.4 million that Green speaks of would provide about 2 to 4 buses a day into the business park which is not meaningful transit. A better option would be to work with TransLink on van-pooling. Our residents are penalized by tolls on the Golden Ears, the Port Mann and the Patullo when it is re-built, with absolutely no rapid transit, unlike that on the north side of the river. Our rail corridor comes at no charge while north of the River costs around $8 million per year. On the matter of the Golden Ears Bridge, the option was a new bridge that gets you across the river in 2 minutes or waiting up to an hour for a tiny ferry. I hardly call that being penalized. Also the Port Mann project will see transit service. We are building the widest bridge in North America! Without the toll, there would be no Port Mann. Let's not forget that TransLink has nothing to do with the Port Mann bridge anyway. Of course the Interurban comes up as a “no charge” solution for the Township. That is a lie. Besides having to work out a deal with BC Hydro, the whole corridor would need to have the tracks replaced, trains purchased, and staff hired. Even with complete track replacement, there would only be 20 minute service which is not rapid. While I’d love the Interurban as I live in the City, the Interurban would not service Walnut Grove or Willoughby effectively. TransLink’s Moving Forward plan did pass and that is a good thing. With the Evergreen Line out of the way, the region can now focus on finding a long-term funding solution which will allow for rapid transit in the South of Fraser. Mayor Dianne Watts and Mayor Peter Fassbender supported the plan because they know the next round of rapid transit projects will be in the South of Fraser. On Friday, I had the chance to tour the SkyTrain control and maintenance yard. I've posted some pictures below that I thought where interesting. Some quick facts about SkyTrain. During the busiest parts of the day, there are only 51 staff that are in the control room or out in the field. The big feature of SkyTrain is that you can have as little or as many trains as you like, but the staffing level can stays the same. Also, SkyTrain is the fastest rapid transit services in Canada with an average speed of 43.5km/h. Calgary's CTrain runs an average speed of 34km/h, while Toronto's street run on average speed of 15km/h. Another interested fact about SkyTrain is that they run a special train that only goes from the inbound platform of Broadway-Commercial to Waterfront during rush-hour due to crowding. If you want to see cutting edge local government at work, turn to Portland, Oregon. On all of the municipal vehicles it says, "City of Portland - A City That Works. On the cusp of extremely efficient transit service delivery and a free downtown streetcar program, Portland makes greater Vancouver look sick. Add the massive bicycle infrastructure and huge amount of people that commute by bike, and you truly have a city that WORKS. I love Portland, can you tell? Here are some photos I took in Portland during my few days here on business. I'll try to post more as the week progresses. Hope you enjoy an unusual glimpse into the City of Portland. Need to drive a car? Looking for a way to harness some energy from the roof of your commercial building? In Portland, even Starbucks Isn't "normal". You can buy beer and wine in a Portland Starbucks.